Poor Oscar Isaac. “What do you mean, Second Breakfast Guy? Oscar Isaac has a great career just kicking off. He’s worked with some amazingly talented people like Nicholas Winding Refn and the Coen Brothers, and he has a starring role in the upcoming Star Wars movie. What do you mean, ‘Poor Oscar Isaac’?” A lot of people really didn’t like Drive because it wasn’t the action movie they thought it would be. A lot of people really didn’t like Inside Llewyn Davis because it wasn’t the comedy they thought it would be. A lot of people aren’t liking the movie I’m reviewing this week, because it’s not an action movie. People: if your only reason for not liking a movie is because it’s different from what you expected, you’re bad at watching movies. 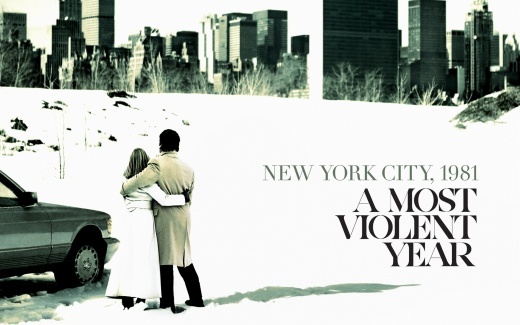 The Plot: 1981, New York City: the most violent year in the city’s history. Completely immersed in a world of disillusionment, cynicism, cruelty, greed, and violence, Abel Morales (Oscar Isaac) strives to lead an honest life. Weeks away from closing the biggest deal of his career running an oil distribution and sales business, Morales’ trucks are continually hijacked, he’s come under investigation by the D.A. (David Oyelowo), his lawyer (Albert Brooks) urges him to arm his drivers against the hijackers, and his wife (Jessica Chastain) continually reminds him that his father- and brother-in-law are both mobsters, ready and waiting to solve his problems. In terrible conditions, with enemies closing in on all sides, Abel Morales must battle to keep his world from falling apart, while maintaining his strict moral sensibilities. Despite any implications in the plot synopsis and the admittedly provocative title, A Most Violent Year is, in fact, not an action movie. Moreover, it has surprisingly little violence. Actually, it’s a pretty slow, quiet film. Writer/director J.C. Chandor is less interested in entertaining than he is in telling a compelling story about engaging people. Oddly enough, those movies tend to be more enjoyable than the ones that hold entertainment as their sole objective. The little action in the film is handled delicately and executed with deliberate precision. Chandor avoids gimmicky camera work—no shaky-cam—in favor of slow, steady movements, and some cleverly placed high angles to firmly establish the viewer as exactly that: a viewer. In this case, the visceral experience of watching the movie takes second, maybe even third place. What Chandor cares about is the human element, and that’s it. And, unless you don’t know how to watch a movie that doesn’t meet expectations, that’s what the audience cares about, too. The underlying theme of A Most Violent Year reminded me somewhat of Locke. Both films focus on an incredibly principled man trying his darnedest to do the best he can in a bad situation. The titular character in Locke has a bad situation because he created it, but Abel Morales’ only fault is his unflappable sense of right and wrong. There is an obvious, simple solution to all of his problems, provided right at the beginning of the movie: just become a gangster, dude. Everyone encourages him to do this, even his wife. There’s a wonderful scene between Morales and the D.A. in which the former shares his philosophy, particularly in answer to the question of ends justifying means. To him, the objective is not as important as the road to it. “There is always a path that is most right,” he says. Not always fully righteous, not always easy, but there’s inevitably an option that is more right than the others, and he has always chosen that path. His other defining principle? Being a great actor. Oscar Isaac is as good as always, maybe even better. Though important, his role in Drive remains somewhat minor, and while he is great in Inside Llewyn Davis, most of his acting comes through in his musical performances. Here, he’s in nearly every scene of a dialogue-heavy movie. If after the previous two films, anyone suspected him of possessing any weaknesses as an actor, this film should surely dispel those nasty little thoughts. 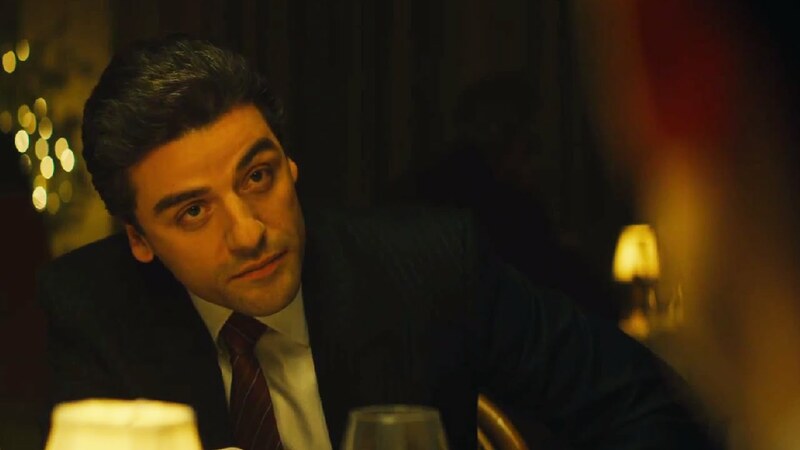 As my companion observed, however, this is a very “Oscar Isaac role.” He somehow always seems to become emotionally isolated or ostracized in ensemble casts of like-minded people. I’ll be interested to see if The Force Awakens gives him something different. The one weakness of the film is Jessica Chastain. Whoa! How could she be a weakness? Well, she’s fabulous. Chandor’s script uses her as much as it uses any of the other supporting characters, because Abel is the main character. But damn, Isaac and Chastain had such a perfectly acted and intriguing repartee that at times I wished the whole movie focused on them and their relationship. I felt that, perhaps, on the page it may not have been written quite as deeply as it was performed, but here we have an honest business man who somehow wound up marrying the daughter of a prominent New York mobster. For some uncertain reasons, they seem to love each other, and she seems to be content in her lifestyle; she keeps the books for the company, runs the numbers, and apparently cares for her two children, but Chastain plays certain lines and moments as if this home life is all some terrible façade for something much darker cooking up underneath, like she’s an honest woman but might also be a gangster. Her scenes are wonderful, but almost distracting. I wanted more of that relationship, and probably wouldn’t have felt that way with a lesser actress in the role. It’s a pretty healthy dynamic. I hope I’ve made myself clear: go into this movie with whatever expectations you want, but once the movie has started, forget about them and just take the movie for what it is, not for what you want it to be. Do that for every movie. Judge it based on what it is, and not what it isn’t. 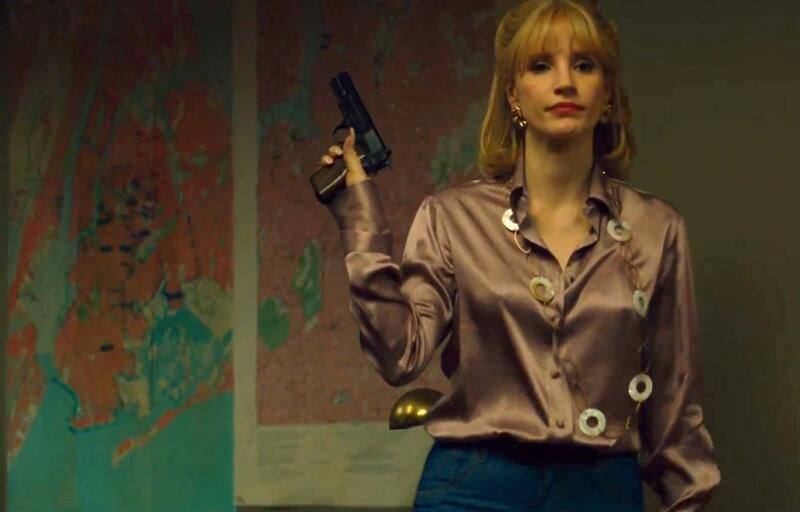 For my part, A Most Violent Year is a damn fine film, a purposeful, methodical twist on the gangster narrative, looking at the one guy who tries to do the right thing in the most terribly wrong year in New York’s history. Great review. Yet to see this. From the sounds of things you haven’t watched Ex Machina. I’ve seen all Oscar Isaac’s performances so far and his role in Ex is his career best. My mate thinks he’s our new Pacino. That’s maybe going a bit too far, but he is incredible.